We’re finally done with Roy’s room! Piece by piece it really came together and I’m so excited with how it turned out. 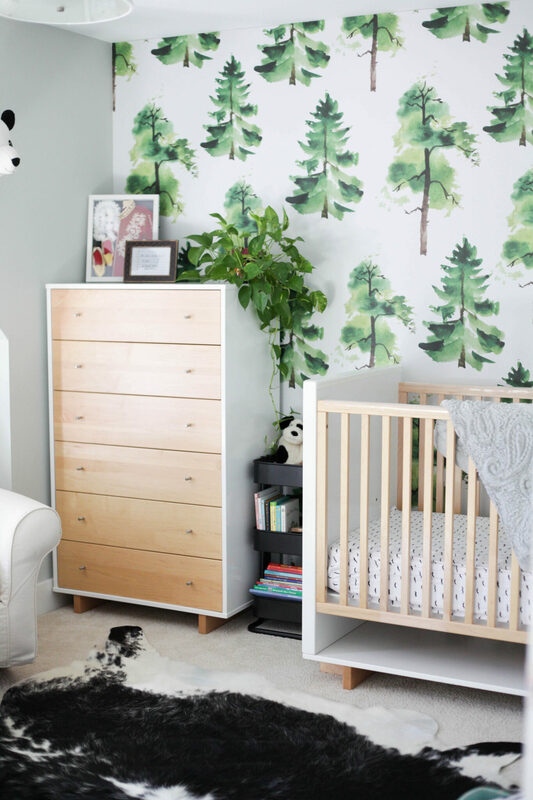 If you’re looking for some nursery ideas for boys (that aren’t too “boy or “childish”), I hope this helps! After we found out we were pregnant with baby #2 we decided the best thing to do is to move Roy down the hall to one of our guest bedrooms so baby girl can have his room since it’s the closest room to our bedroom. 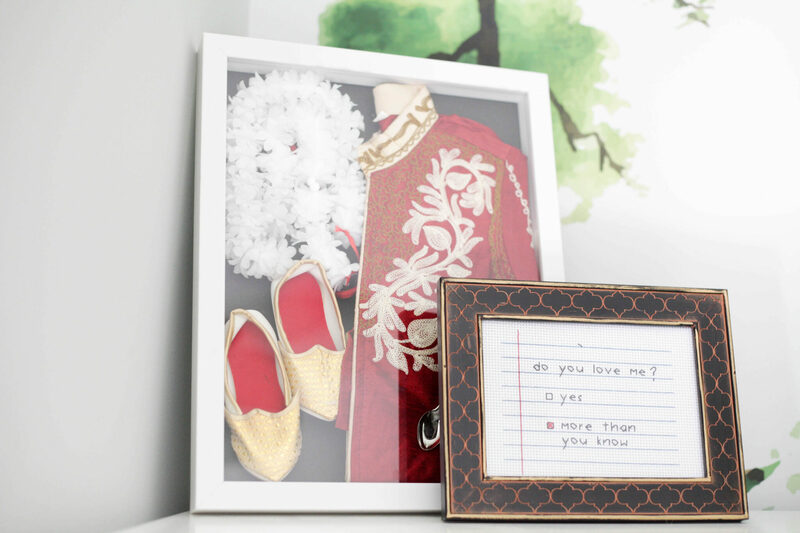 It also gave me a chance to decorate not just one but two rooms (and I LOVE to decorate!). 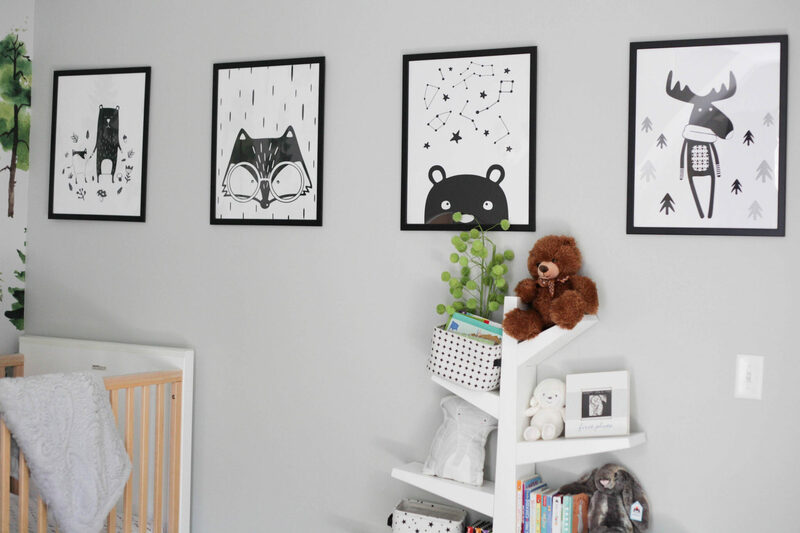 I searched high and low for nursery ideas for boys and ultimately came up with our own plan. We wanted something playful yet not to “kid” that we all loved spending time in. We’re fortunate enough to live in Minneapolis where there is a Room and Board Outlet so we randomly stopped by one day and lucked out when we found a super cute Moda crib and dresser in maple and white! Our other crib and dresser are white and with a hint of blue so having something so much different is a welcome change. Roy’s original nursery had a fun wall decal accent wall and we decorated with teal and mustard yellow (see his first room here) so we decided to switch things up a bit! 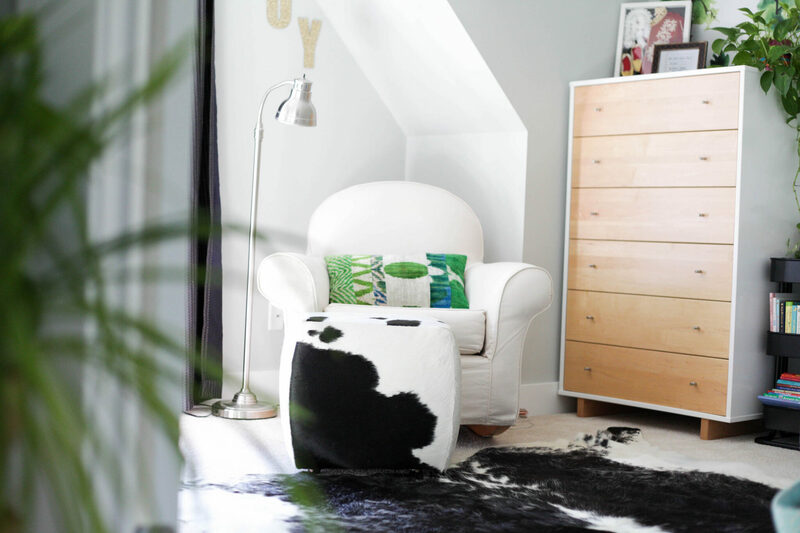 We stopped into Witt & Bliss on our mini babymoon and found a cow rug and fun green pillow and decided that those would be our inspiration pieces. I love having one main inspiration piece to go off of when decorating a room (for Roy’s nursery we based it off of the rug). We wanted to do another accent wall but decided to try removable wallpaper this time around. 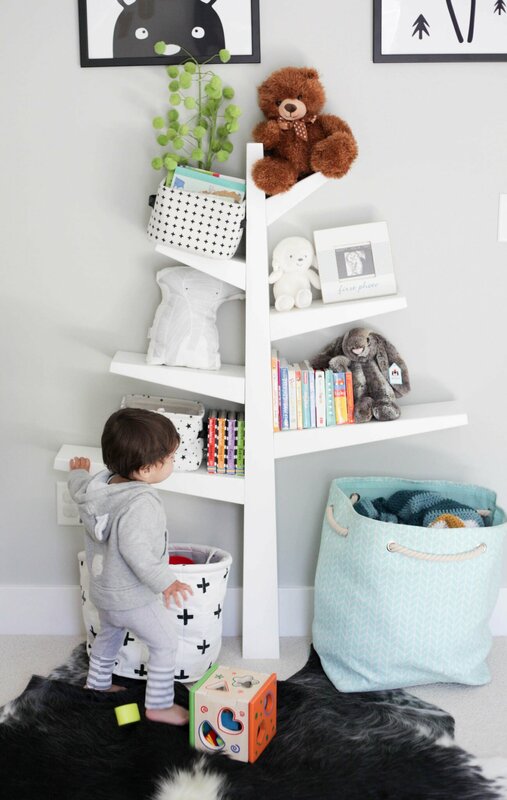 Rishi found the adorable tree bookshelf during the Nordstrom sale (you can also find it at Target). It definitely is not as functional as your standard bookshelf but it does the job of housing books, stuffed animals and our small bins of lightweight toys (I made the mistake of putting a heavy toy on one branch only to have Roy pull it down…thankfully it just landed on the carpet but I learned my lesson!). I picked up the black cart at IKEA to house the bigger books that didn’t fit well on the shelf. It’s also perfect for random toys and stuffed animals. This will likely evolve over time depending on what Roy is playing with! I absolutely love the stuffed animal heads that are popping up everywhere and found the cute panda bear at Target. 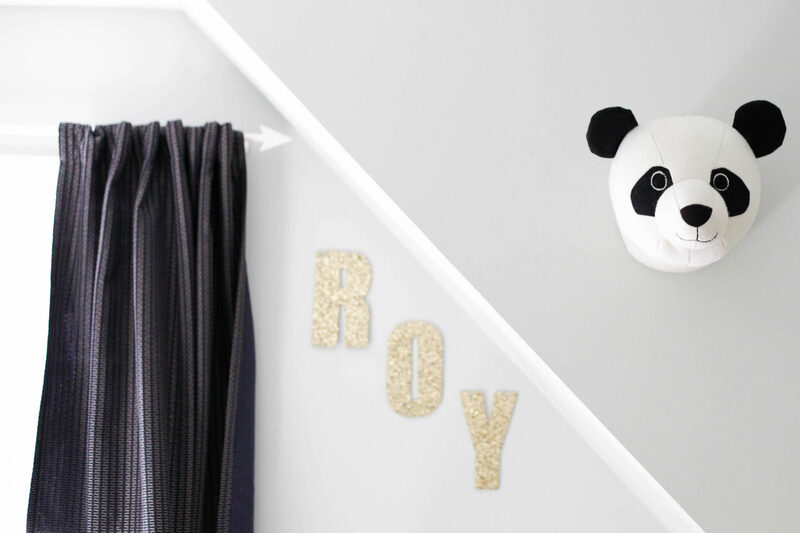 I thought it was perfect for the little nook in the corner with the ROY letters from his nursery (that are now on sale at PB Kids)! We wanted kid friendly prints for the walls and found some on Etsy that were perfect. We originally had completely different prints that ended up not going well with the wallpaper. They now live in the guest/kid bathroom. 🙂 I love how the black and white tie in the black and white rug perfectly. Our amazing neighbors gave us the glider which is already getting lots of use with bedtime snuggles and story times. We weren’t sure we were going to put a rocking chair in the room but I’m glad we did! Roy’s still so young so it’s nice to be able to cuddle him during naps if he’s not feeling well (like when his molars popped through the other weekend) or when we do storytime. And I finally got Roy’s Annaprashana outfit framed in a shadow box! I love his adorable outfit out for us to see. 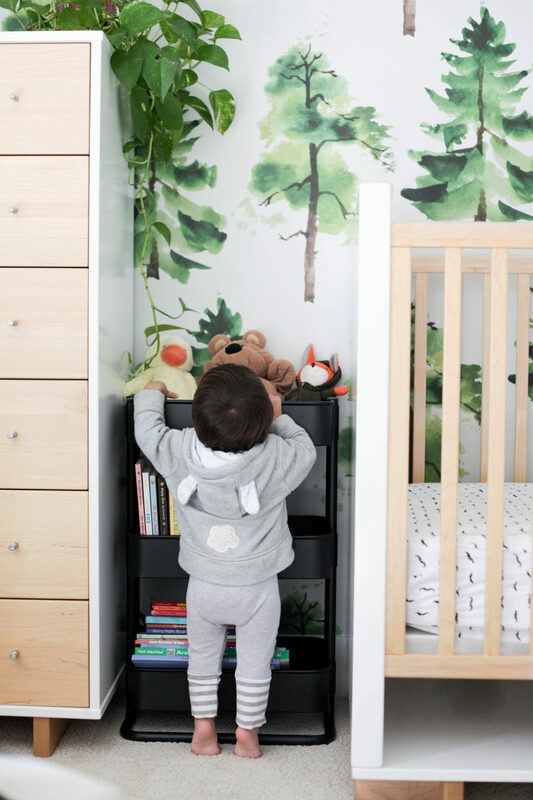 I am SO in love with how his room turned out and I hope it helps give you some nursery ideas for boys! It makes me happy just hanging out in there and I hope Roy feels the same!